Items Needed: Spray bottle, rat-tail comb, 1 clear elastic band. You can view this video below. Keep in mind, you can finish this hairstyle any number of ways. You can tuck the braid under a down ‘do, like often seen, or you can wrap the braid into a fun ponytail (with accessories). This is completely up to you. 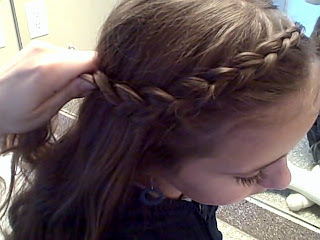 It is a hairstyle that can be used on girls of all ages, moms included!